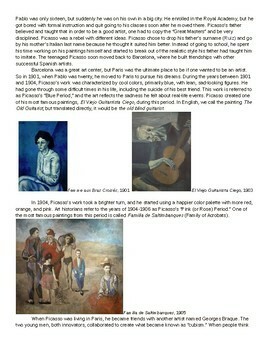 -A four-page article about Picasso's life that includes information about his childhood and adolescence, his early work, Blue and Pink periods, Cubism, marriage to Olga, children, his politics and anti-war work. Within these pages are examples of the paintings that the text talks about. 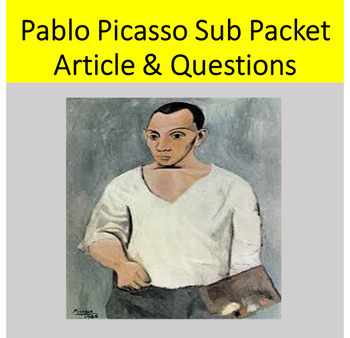 -33 questions, some of which are simple factual questions and some which require students to give their opinions and/or compare/contrast the art. To use this resource, I suggest that you make a class set of the article that students will use all day, as well as copies that students can share that are in color. Then you can make copies of the questions for each student. 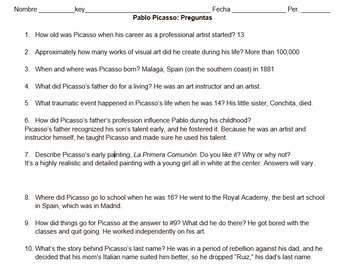 When I used this resource with my students, I printed out several different 8 1/2 x 11 pictures of more of his famous paintings so that kids could get a better idea of the range of his artwork. Because I'm trying to work within the confines of fair use for TPT, I can't include as many as I would if I were doing it with my classes. 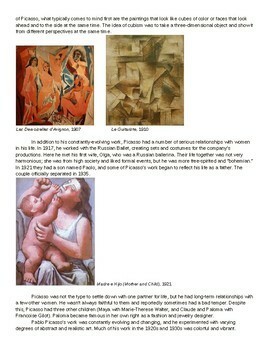 If you have time, I suggest that you google a variety Picasso paintings from his different periods, print them in color, and put them up where students can see them.